Здесь вы можете прочитать биографию Стивена Кинга на английском языке. 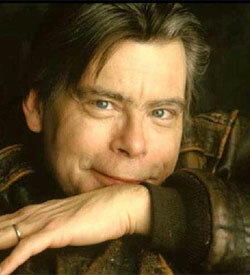 Stephen Edwin King (born 21.09.1947) - American author. Stephen Edwin King is an American author best known for his bestselling horror novels. King was the 2003 recipient of The National Book Foundation's Medal for Distinguished Contribution to American Letters. In many ways Stephen has changed the movie and book industry forever. he has influenced many currently famous writers. King evinces a thorough knowledge of the horror genre, as shown in his nonfiction book Danse Macabre, which chronicles several decades of notable works in both literature and cinema. He has also written stories outside the horror genre, including the novella collection Different Seasons, The Green Mile, The Eyes of the Dragon, The Stand, Hearts in Atlantis and his magnum opus The Dark Tower series. In the past, Stephen King has written under the pen names Richard Bachman and (once) John Swithen. When King was three years old, his father, Donald Edwin King, deserted his family. His mother, Nellie Ruth Pillsbury, raised King and his adopted older brother David by herself, sometimes under great financial strain. The family moved to Ruth's home town of Durham, Maine but also spent brief periods in Fort Wayne, Indiana and Stratford, Connecticut. As a child, King witnessed a gruesome accident - one of his friends was caught on a railway track and struck by a train. It has been suggested that this could have been the inspiration for King's dark, disturbing creations, though King himself dismisses the idea. King attended Durham Elementary School and Lisbon Falls High School. King has been writing from a young age. When in school, he wrote stories based on movies he had seen recently and sold them to his friends. This was not popular among his teachers, and he was forced to return his profits when this was discovered. The stories were copied using a mimeo machine that his brother David used to copy a newspaper, Dave's Rag, which he self-published. Dave's Rag was about local events, and King would often contribute. As a young boy, King was an avid reader of EC's horror comics, which provided the genesis for his love of horror. He loved reading Tales from the Crypt. His first published story was "In a Half-World of Terror" (retitled from "I Was a Teen-Age Grave-robber"), published in a horror fanzine issued by Mike Garrett of Birmingham, Alabama. From 1966 to 1971, King studied English at the University of Maine at Orono. At the university, he wrote a column titled "King's Garbage Truck" in the student newspaper, the Maine Campus. He also met Tabitha Spruce; they married in 1971. King took on odd jobs to pay for his studies, including one at an industrial laundry. He used the experience to write the short story "The Mangler" and the novelette "Roadwork"(as Richard Bachman). The campus period in his life is readily evident in the second part of Hearts in Atlantis. After finishing his university studies with a Bachelor of Arts in English and obtaining a certificate to teach high school, King taught English at Hampden Academy in Hampden, Maine. During this time, he and his family lived in a trailer. He wrote short stories (most were published in men's magazines) to help make ends meet. As told in the introduction in Carrie, if one of his kids got a cold, Tabitha would joke, "Come on, Steve, think of a monster." King also developed a drinking problem which stayed with him for over a decade. During this period, King began a number of novels. One of his first ideas was of a young girl with psychic powers. However, he grew discouraged, and threw it into the trash. Tabitha later rescued it and encouraged him to finish it. After completing the novel, he titled it Carrie, sent it to Doubleday, and more or less forgot about it. Later, he received an offer to buy it with a $2,500 advance (not a large advance for a novel, even at that time). Shortly after, the value of Carrie was realized with the paperback rights being sold for $400,000 (with $200,000 of it going to the publisher). Soon following its release, his mother died of uterine cancer. His Aunt Emrine read the novel to her before she died. In On Writing, King admits that at this time he was consistently drunk and that he was an alcoholic for well over a decade. He even admits that he was intoxicated while delivering the eulogy at his mother’s funeral. "I think I did a pretty good job, considering how drunk I was at the time." (On Writing: A Memoir of the Craft) He states that he had based the alcoholic father in The Shining on himself, though he did not admit it (even to himself) for several years. Shortly after the publication of The Tommyknockers, King's family and friends finally intervened, dumping his trash on the rug in front of him to show him the evidence of his own addictions. As King related in his memoir, he sought help and quit all forms of drugs and alcohol in the late 1980s, and has remained sober since. King spends winter seasons in an oceanfront mansion located off the Gulf of Mexico in Sarasota, Florida. Their three children, Naomi Rachel, Joseph Hillstrom King (who appeared in the film Creepshow), and Owen Phillip, are grown and living on their own. Both Owen and Joseph are writers; Owen's first collection of stories, We're All in This Together: A Novella and Stories was published in 2005. The first collection of stories by Joe Hill (Joseph's pen name), 20th Century Ghosts, was published in 2005 by PS Publishing in a very limited edition, winning the Crawford Award for best new fantasy writer, together with the Bram Stoker Award and the British Fantasy Award for Best Fiction Collection. Tom Pabst has been hired to adapt Hill's upcoming novel, Heart-Shaped Box, for a 2007 Warner Bros release. King's daughter Naomi is a Reverend in the Unitarian Universalist Church in Utica, New York, where she lives with her partner. In 2002, King announced he would stop writing, apparently motivated in part by frustration with his injuries, which had made sitting uncomfortable, and reduced his stamina. "I'm writing but I'm writing at a much slower pace than previously and I think that if I come up with something really, really good, I would be perfectly willing to publish it because that still feels like the final act of the creative process, publishing it so people can read it and you can get feedback and people can talk about it with each other and with you, the writer, but the force of my invention has slowed down a lot over the years and that's as it should be. I'm not a kid of 25 anymore and I'm not a young middle-aged man of 35 anymore — I'm 55 years old and I have grandchildren, two new puppies to house-train and I have a lot of things to do besides writing and that in and of itself is a wonderful thing but writing is still a big, important part of my life and of everyday." Since 2003, King has provided his take on pop culture in a column appearing on the back page of Entertainment Weekly, usually every third week. The column is called "The Pop Of King", a reference to "The King of Pop", Michael Jackson. In October 2005, King signed a deal with Marvel Comics, to publish a seven-issue, miniseries spinoff of The Dark Tower series called The Gunslinger Born. The series, which focuses on a young Roland Deschain, is plotted by Robin Furth, dialogued by Peter David, and illustrated by Eisner Award-winning artist Jae Lee. The first issue was published on February 7, 2007, and because of its connection with King, David, Lee, and Marvel Editor-in-Chief Joe Quesada appeared at a midnight signing at a Times Square, New York comic book store to promote it. The work had sold over 200,000 copies by March 2007. In June 2006, King appeared on the first installment of Amazon Fishbowl, a live web-program hosted by Bill Maher. King, a long time supporter of small publishing, has recently allowed the publication of two past novels in limited edition form. The Green Mile and Colorado Kid will receive special treatment from two small publishing houses. Both books will be produced and be signed by both King and the artist contributing work to the book. Half of King's published work has been re-published in limited (signed) edition format. On February 14, 2007, Joblo.com announced that plans were underway for Lost creator J. J. Abrams to do an adaptation of King's epic Dark Tower series. King will soon publish the novel Blaze, which was written in the early '70s, under his long-time pseudonym Richard Bachman. He is also finishing the novel Duma Key and writing a play with John Mellencamp titled Ghost Brothers Of Darkland County. On April 20, 2007, Entertainment Weekly asked King if he felt there was a correlation between Seung-Hui Cho's writing and the Virginia Tech massacre. King stated, "Certainly in this sensitized day and age, my own college writing would have raised red flags, and I'm certain someone would have tabbed me as mentally ill because of them" and "Cho doesn't strike me as in the least creative, however. Dude was crazy. Dude was, in the memorable phrasing of Nikki Giovanni, 'just mean.' Essentially there's no story here, except for a paranoid a--hole who went DEFCON-1." King felt that Cho's work had issues because of its themes and the lack of writing ability and a meaningful story.